The program, after installed, runs automatically when Windows boots in the background. It then runs whatever you have setup on a scheduled task. 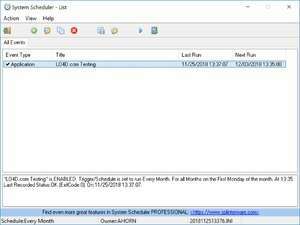 For security reasons, you should also check out the System Scheduler Free download at LO4D.com which includes virus and malware tests. Additional screenshots of this application download may be available, too.